The sun gives off invisible rays of ultraviolet light. Ultraviolet B (UVB) rays are short, high-energy wavelengths that are absorbed by the epidermis, the outermost layer of the skin. When you burn, the skin responds to UVB rays by producing chemicals called inflammatory mediators, some of which seep down into the dermis, the skin’s middle layer. These chemicals irritate the tiny blood vessels in the dermis, which swell and create the surface redness of the burn. At the same time, the UVB rays affect the genetic material of the epidermis, which causes the damage that may lead to skin cancer. Other UVB rays can affect the immune system and interfere with the skin’s ability to repair itself. Finally, UVB radiation attacks the skin’s melanocytes (pigment cells). The melanocytes react by stepping up production of melanin and sending melanasomes to the skin’s surface to act as a filter against the sun’s rays actually damage the DNA of the pigment cells. This kind of genetic damage causes both freckling and the mottled brown of age spots. More seriously, it contributes to the development of melanoma and other skin cancers. Ultraviolet A (UVA) rays – longer than UVB rays – can also do lasting damage. They penetrate the skin more deeply than UVB rays, affecting the DNA of the cells in the dermis, attacking cell membranes, and changing the proteins that make up collagen and elastin, which support the skin’s fibrous structure. By undermining these parts of the skin, UVA rays lead directly to wrinkles and sagging of the skin. They also contribute to the loss of support for the skin’s tiny blood vessels, which become permanently dilated. This shows up as a general ruddiness or visible spider veins on the nose, cheeks and chin. UVA rays also play a role in the development of skin cancer. In the past, the ozone layer in the atmosphere provided a blanket of protection from the sun’s damaging rays. The ozone layer in the atmosphere has been thinning over the past several years due to air pollution. As a result, the sun’s damaging rays can reach earth more easily and there has been an increase in the incidence of skin cancers. Preventing your exposure to ultraviolet (UV) radiation is the best way to diminish your chance of getting all skin cancers, including melanoma. Be sun smart. Don’t use tanning beds. Reduce your risk by protecting your skin. For more information about the major types of skin cancer- basal cell carcinoma, squamous cell carcinoma, and malignant melanoma – please visit our Skin Resource Center. 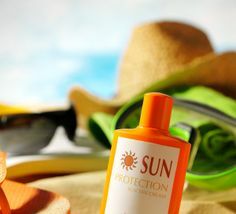 To protect against damage from the sun’s rays, it is important to avoid the sun between 10 a.m. and 4 p.m., when the sun’s rays are strongest; to wear protective clothing; and to use a sunscreen with an SPF of 15 or higher. Another way to determine when to stay out of the sun is by following the shadow rule: “Short Shadow- Seek Shade.” The intensity of UV rays is directly related to the angle of the sun or altitude above the horizon. The shadow rule indirectly determines the sun’s altitude by observing the length of a person’s shadow during the course of the day. When a person’s shadow is shorter than the person is tall, the intensity of the UV rays from the sun is more likely to cause sunburn. The best protective clothes are loose fitting garments made from fabric that is tightly woven. Darker colors may offer more protection than light-colored clothing, and dry clothes provide better protection than wet ones. A wide-brimmed hat that offers a lot of shade is the best choice for protecting head, face and neck. If long pants and a long sleeved shirt can’t be worn because of the temperature, it is important to wear a dry T-shirt, stay in the shade as much as possible, and always wear sunscreen. Sunscreens provide protection by absorbing, reflecting or scattering the sun’s rays. They may also contain chemicals that interact with the skin to protect it from UV rays. Sunscreens are rated according to their effectiveness by the sun protection factor (SPF). A product’s SPF number helps determine how long the product will protect you before you need to re-apply it – how long you can stay in the sun without burning. For example, you may normally burn in 20 minutes. If you apply an SPF 15 sunscreen, you’ll be protected for about 300 minutes, or five hours (SPF 15 x 20 minutes = 300 minutes). A person with lightly pigmented skin who burns in 10 minutes would be protected for only about two-and-a-half-hours with SPF 15 (SPF 15 x 10 minutes = 150 minutes). Sunscreens with SPF numbers higher than 15 may work well for people who have lightly pigmented skin, live at high altitudes, or work or play outdoors much of the day. To get the most protection from your sunscreen, apply it liberally at least 30 minutes before going outside and remember to re-apply it after swimming or perspiring heavily. If you’re taking medication, ask your doctor or pharmacist if it will make your skin more sensitive to the sun. Certain antibiotics, birth control pills, diuretics, antihistamines, and anti-depressants can increase one’s sensitivity to the sun’s rays.